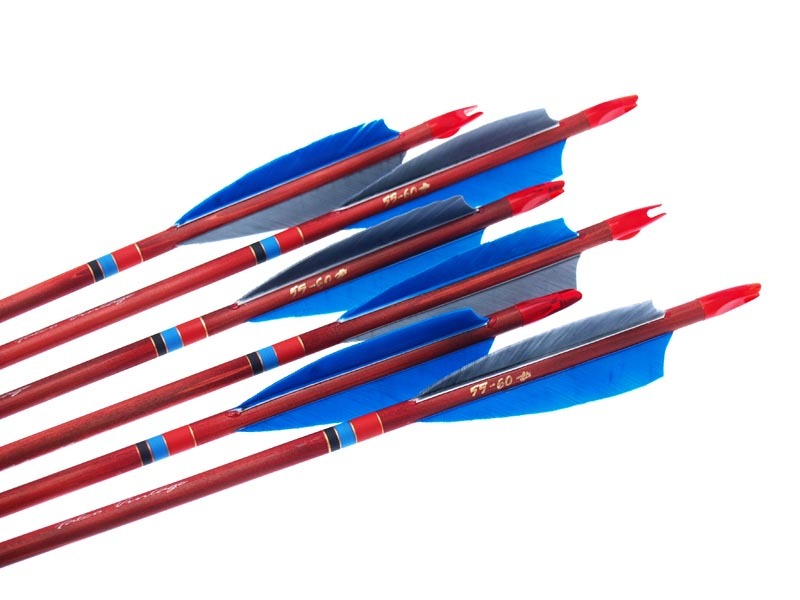 Falco Premium arrows are the best known and most successful wooden arrows in top level archery. In the World Championships of WA 3D in 2017, four out of six podium places were won with Falco Premium arrows (and a total of 6 medals). It is very difficult for others to match Falco quality because in order to reach that level, we have to always stock more than 30 POC thousand shafts, which are then hand-picked to individual sets for our customers. All our arrows are hand-made by the Falco in-house arrowsmith team. After years of thorough testing with very different arrow materials we have come to the conclusion that when it comes to shaft wood, there is no match in the world to Oregon Port Orford cedar or P.O.C. It's premium qualities are its light weight, aerodynamically smooth surface and extraordinarily straight grain. Its most important quality though is its unique memory when it comes to hits and bends - it has the ability to withstand pressure like any other shaft-wood and therefore is by far the best wood for arrows in the world by our evaluation. Falco Premium Vintage arrows represent the best quality of wooden arrows as our biggest goal is to produce a stable set of arrows at all times. Premium Vintage arrows are usually produced per dozens, using the more common 5/16" and 11/32" diameter shafts but if requested, also the more thicker 23/64" P.O.C. Premium shafts. Each shaft is manually spined, weighed and checked for grain straightness, shaft straightness and surface smoothness. 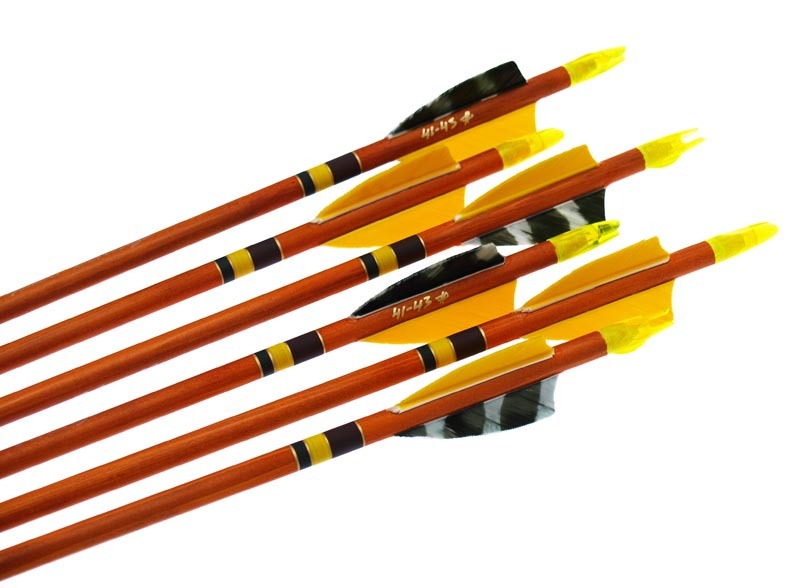 The arrows are then grouped into sets making them the best quality and most checked arrows. We tolerate a spine difference of 2-5# and weight of 0,2-0,5 grams. At completing the arrows, we use almost all the available colors and patterns of turkey feathers - we offer one-color, barred and camo versions of the feathers. The available shapes for the vanes are shield and parabolic but we also offer the less-used traditional and banana shapes. For the nock, we mostly use the best suitable nock for wooden arrows - the Classic nock. The point of your arrows can be chosen from steel point, Tophat 3D and regular Field-point, also brass point (bullet screw-on). At special request we can also offer stainless steel and lenghtened hollow aluminum points. The shaft is designed customly according to the buyers request by staining and coloring of the shaft. The natural part of any arrow is also a manually made cresting. 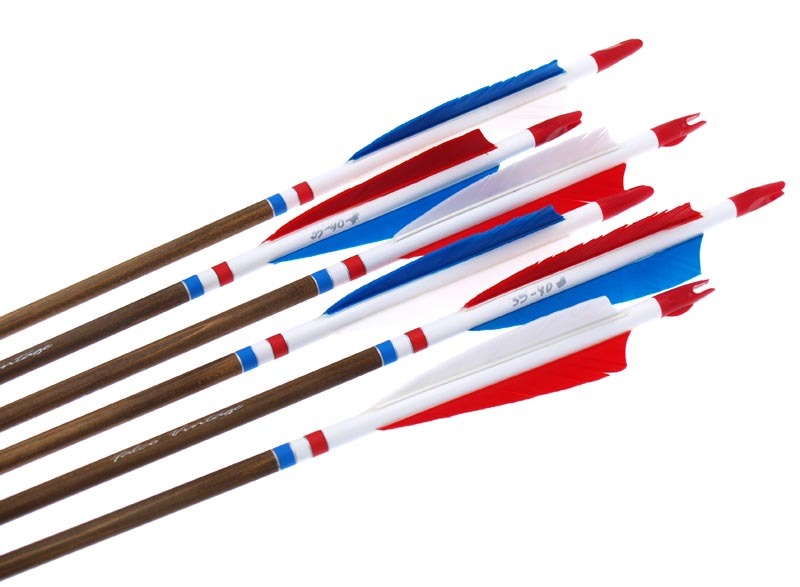 Premium Vintage arrows can be ordered by providing your suitable details about the arrow characteristics, color and design. The more precise your description the more suitable will the arrows be to your taste and preference. On the top of this page you can also order your arrows via our ordering system.